One of the most frequent questions at this time of the year is “which ice melter is safe to use on our new concrete that was poured this past summer”. In truth, there is nothing that is 100% safe when it comes to ice melters. Anytime you use a “safer” product that has no rock salt in it, there is still a chance that damage can be done, especially if the concrete is under 1 year old or the surface in question is something very delicate, such as natural flagstone. The answer is to provide traction on these slippery surfaces with EcoTraction! This product is 100% safe for concrete and provides traction even on top of inches of ice. EcoTraction is made from natural volcanic minerals and poses as no danger to surfaces, pets, or the environment. In fact, it is a natural soil aerator and can be brushed into your lawn or garden and provide benefits there too! How does it work? EcoTraction is entirely made up of volcanic minerals that are colored a dark green. The “gritty” texture of the granules will embed themselves into dangerous snow and ice and provide instant traction! The granules do not dissolve and are reusable, if you choose to save them. EcoTraction will make surfaces safe to walk on immediately, without the use of chemical ice melters, meaning that is is safe for pets of all types. Does it work better than sand? Yes, EcoTraction far exceeds the performance of sand. EcoTraction’s shape is larger and more irregular than sand. The “gritty” texture provides more non-slip grip because there is more texture than sand would ever provide. The irregular shape also prevents tracking into your home or car, which is always a plus during this item of the year! How much do you have to use? Coverage is actually really good. 1 cup is recommended for up to 144 sq ft (or about the area of a parking spot). This is about 9X the coverage you get from the same amount of rock salt. 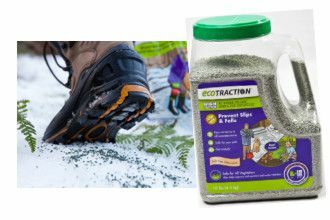 If you are concerned about providing traction on delicate surfaces or areas where your pets walk, we recommend you try EcoTraction… you will not be disappointed!